For more than 25 years, Direct Animal Products, a division of the TriStar Metal family has manufactured custom stainless steel equipment. We’ve continued to show our dedication to the animal care industry and animal health professionals as we have brought innovative animal care products to market. As experts in the business, our commitment to providing the animal care industry durable, top quality, innovative products continues to be our top focus in 2011. Our quality control and field testing begins with our customers. At Direct, our customer service continues to be our top priority. Our staff is dedicated to solving your needs, whether you are looking to update your facility or building a new one, we want to be your stainless steel equipment partner. Direct Animal Products can help provide inspiration and solutions for any budget with products that are built to last. Our products are proof that we continue to set new standards and develop new features with you in mind. From our designers to production staff we take pride in providing products of the highest quality. Almost everything we manufacture can be tailor-made to fit the dimensions for your existing or new facility. 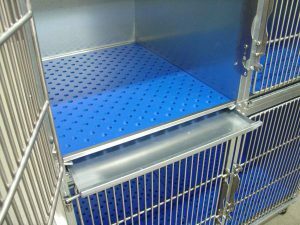 That’s because Direct Animal Products customizes each order to our client’s specifications, and our National Sanitation Foundation rating, ensures our clinical equipment meets the same sanitation requirements found in human hospitals. When you invest in a Direct Animal product, you are getting the highest quality available in the industry today. Our customer inspired stainless steel equipment is the Direct difference. We look forward to serving you.